Many people are considering having a gym in their own home. However, one must always be aware that a home studio, of course, cannot compete with the equipment of a public gym, in which a single training device can cost a lot. If you want to train in your own home, you first need a well-equipped home gym. This means that need to purchase all necessary devices and accessories which can replace the regular gym. Also, you need a suitable location - the corner in the bedroom or hallway is in the long run rather suboptimal and not very motivating. If you have a house, the cellar or garage can be a good choice for the home gym. If both conditions are met, nothing stands in the way of a home gym. Advantages and disadvantages should be weighed well against each other. Advantages of a home gym? This can be one of the most important points against the gym for a lot of people. It's cold, gray and wet outside and you have to leave the warm four walls to go to the gym? Let's face it, this is a number one excuse for the most of the people. Also, maybe you have to take a bus. Sometimes a journey of 10-15 minutes can become 45 minutes because of the traffic jam. Of course, there is no seat available and you have your backpack and equipment. If you have car and gym does not have private parking, you can add 5-10 more minutes of searching where to park your car. If you manage to find it, there is a huge probability it will not be close to the gym. And if most people today lack something, then it's time. In the gym, a variety of exhalations combine into a very special scent cocktail. Everybody sweats. But sweat smell develops in connection with bacteria. Daily personal hygiene and a strong antiperspirant can often help. Smelly towels and sports clothes make for an unpleasant stuffiness. Also, everybody inhale and exhale all the time. Of course, without such breathing, doing sports relatively bad. But, if the gym is small and there was no proper distance for the machines, imagine how does it look like having 20+ people breathing heavily all the time? That’s not the problem you will face at home. With your own home studio you save long term costs. In a gym you pay monthly basic fees and even if these are relatively low, the costs add up over the months or years considerably. Instead, the money you put into your home equipment will pay off over the years. At your home gym you can work out when you feel like it. Hours are therefore not an issue when it comes time just to complete a crisp training session. Training even for 10-20 minutes in the morning or when you get home from work before dinner becomes an option. These shorter bursts of training can keep help you stick to a routine and build positive habits in the day. we all hate when we have to wait for someone to finish their session. In the Home gym, you do not have to wait for anybody, because nobody else uses your rack or your dumbbells. You can start and finish your training at any time. You can always make your own playlist or play exercise tutorials on your TV, and you can turn the volume up to get you pumped. Some people find this a big positive, being able to push yourself in the gym is important, whether going for the harder weights or pushing out that extra rep, your personal playlist can keep you motivated and drive better results. Since your home gym consists only of you, you cannot get support from trainers or coaches. If you have difficulties with the execution, you have to try to be self-taught and work on the technique until everything is right. A professional gym has always qualified coaches at the start, which can give you valuable tips here. Getting a workout buddy or partner to join you at home can go a long way in getting around this issue. Plus with the cost savings, it'll be a lot easier to convince them to partner up. With the cost of setup, it can take some time to get all the equipment you need, however, you can just start out with a few important pieces (e.g dumbell sets) that will allow you to perform a core range of exercises. One other option is to purchase your gym on a plan, so you can pay it off over time. This is an incredibly affordable option. There are lots of payment options that will allow you to get your ideal home gym setup immediately and pay this off over time, often for the same price as a regular gym membership. To find out more see our post on home gym payment options. At home, many other things can be done besides training. Even if these are not really important, they can keep you from training - and thus endanger your overall development. In the gym, you can only train – no other distraction beside conversation with others can affect your training. To get around this, plan your workout time and stick to it. If you promise yourself you will spend 40 minutes in the gym at home, stick to it. Don't go over, or that can lead to avoiding the gym in the future. If you stick to your workout, reward yourself afterward with your favorite smoothy, some 'me' time or allowing yourself some other reward. How to start with the home gym? The first step in setting up a gym at home is to think about how much space is actually available to you. If you have a whole room at your disposal to set up your gym there, you have the advantage that you have all the training equipment immediately on hand and can start your training at any time. If you do not have the luxury of having your own gym, that's not a problem as long as you organize yourself sensibly. Make yourself a place in your living room or bedroom, which you can rebuild with only a few simple steps to the training area. Organize your exercise equipment so that they all together in a closet or similar. The question of the costs of your home gym is very individual. With a range of about one hundred to a few thousand dollars, it's just a question of how much you want to invest and how much you can invest. It is definitely worth buying high-quality fitness equipment as they last much longer. Depending on your needs you may want to check out some cornerstone equipment for your gym to center your main workouts around. You may want to consider any of the following options. Functional trainers are the perfect machine to help you target specific muscles for strength training. 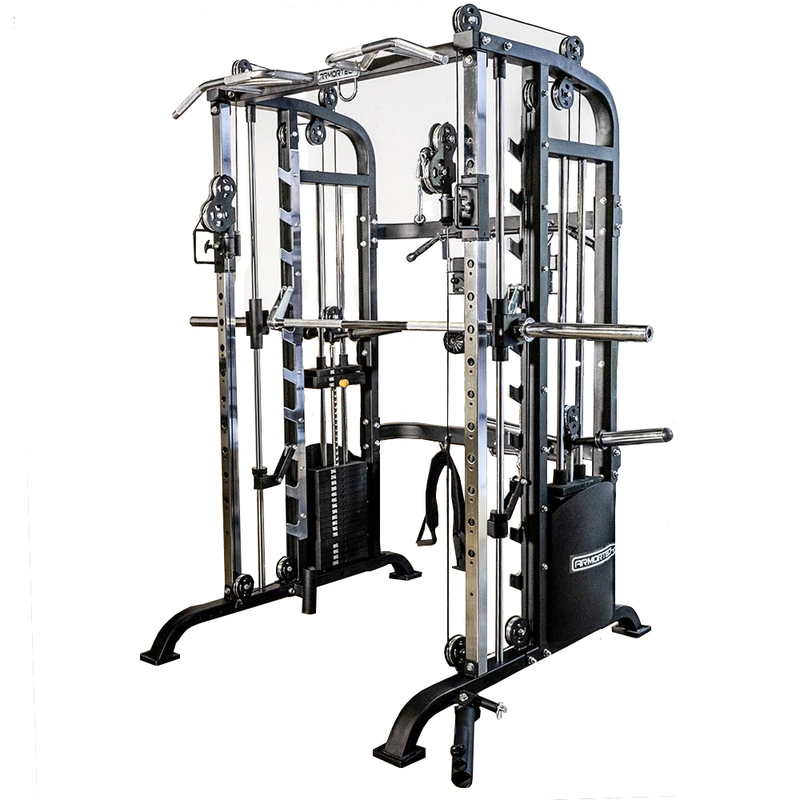 They are extremely versatile with the equipment incorporating a smith machine, power rack cable crossovers, seated rows adn more. If you are serious about an all-round gym for you home, you will definitely want to consider getting one of these. Home Gyms are a great piece of equipment for a full body workout. Home Gyms usually include equipment for a seated chest press, let extensions, lat pulldowns and seated rows. This combination gives you plenty of options for your heavy lifts. A good Power Cage can form the cornerstone of many of your heavy strength exercises. These racks act as your own spotter for free-weight barbell exercises such as heavy squats. This can also act as your bench press and pull-up station. To round out your home gym, its great to include at least one piece of cardio. Airbikes or rowers are often a great option to help you with HIIT training and burn some serious calories. However, Treadmills will continue to be a favorite amongst many gym goers also. If you want to take your gym to the next level, investing in a really good Dumbbell set will help you do just that. Dumbbells will add an incredible diversity of exercises and allow you to keep mixing up your training. If you have space, a good set of fixed dumbbells, like the hex rubber dumbells can be a worthwhile investment. This will save you time changing your weight plates so you can just focus on your exercise. Take the time to select a gym that will work for you. Remember, your home gym is an investment both in the equipment you get to keep and in your health. With the many payment options available it should be more affordable than ever to get your own gym at home and make it your zone.